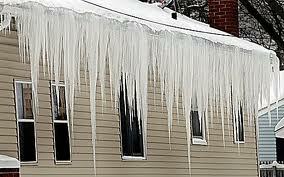 Winter Problem: Certain winter weather factors can cause snow and ice buildup on your roof and in the gutters. In some situations, this can cause water to leak into the house. Cause: When snow and ice on the roof start to melt (from outside temperatures or inside heat rising to the roof) the water can't always drain away since it's blocked by other ice. It backs up and leaks into the house causing damage to ceilings, walls and floors. Even the framing of the house can be affected. Solution: Install special heating cables to melt a pathway in the ice so the water can drain down the roof into the gutter and down the downspout. Proper installation is important since the problem area needs to be covered properly with a good route for the water to flow. Also, you need to know if your heat cables are turned on or not. The location of the switch, with a pilot light to tell you it's on is important. If you've got a problem, contact us to find the solution.